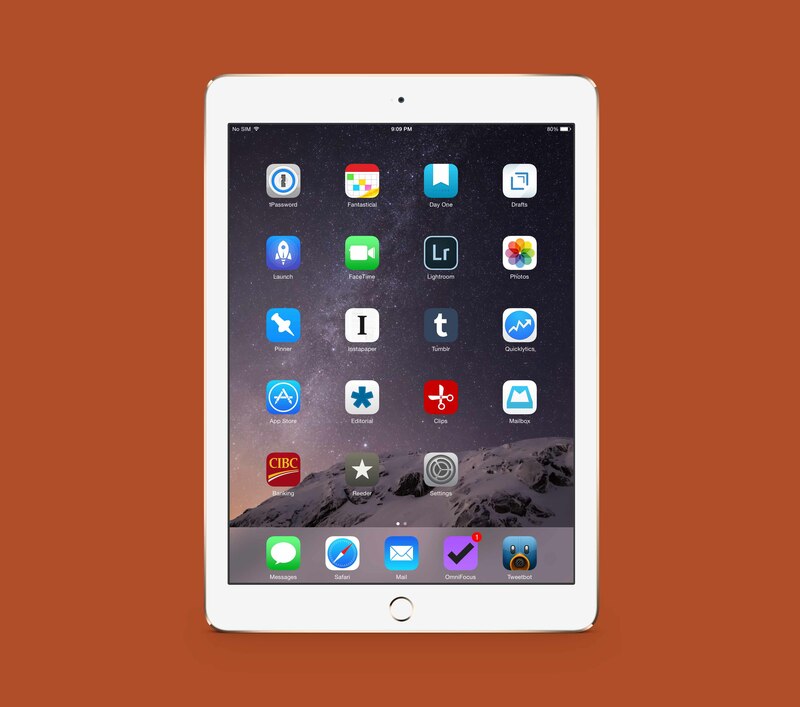 Luckily for me, November’s starting date falls within my review period of the new iPad Air 2. It’s been a marvelous week so far. Each day, I inch closer to making the upgrade from Air to Air 2. It’s just that good. But I’ll talk more about this another day. On the other side of the coin, the iPhone 6 Plus continues to be the best Apple product I currently own. Any other smaller phone looks like a piddly toy, including the iPhone 6 itself. Perhaps oddly, the iPhone 6 Plus has increased how much I use my iPad. I love the extra screen real estate and better keyboard the iPhone 6 Plus offers on the go, but nothing beats the iPad’s use as a general computer around the house. If I decide to stick with the Air 2, the only device that will see less usage is my aging MacBook Pro. With that said, here my homescreens as of November 1, 2014. I’ve got a few new additions to talk about, not the least of which is iOS 8 itself. You can see last month’s homescreens here. I officially gave in and became an Adobe Creative Cloud subscriber, meaning I can now experience the brilliance of Lightroom on this less-than-a-pencil-thin device. Adobe Lightroom on the iPad won’t replace Lightroom on my Mac, but it’s certainly an improvement over any photo editor I’ve tried previously. I moved Reeder 2 out of my dock as I have been using my iPad for sending messages far more than for reading my RSS feeds of late. I could add both to my dock, but I hate the cluttered look of six app icons in my dock. Gone are MLB at Bat, Delivery Status Touch, Maps.app and Overcast. I’ve welcomed the newest version of Drafts to my homescreen. I still don’t use these text-silo apps very much (especially on the iPad), but I like the way Drafts can quickly sync text between my iPhone and iPad. Also included is the FaceTime app. I never FaceTime anyone, but iOS 8’s new Continuity features mean I don’t have to reach for my iPhone to make actual phone calls anymore. FaceTime has essentially become my Phone.app on my iPad and I figured a spot on my homescreen was pretty worthwhile. Lastly, Clips. I would have never heard of Clips if not for Federico Viticci’s review and I’ve become a hearty user ever since. Clips is the actionable clipboard manager I’ve been waiting for on iOS. Clips’ great Notification Center widget and sharesheet extension allow you to save copied bits of text from anywhere in iOS 8. From there, you can manipulate your clippings by adding the title of the URL or other tidbits of your choosing. Clips is an ingenious app and I find it especially useful when compiling my Sunday Editions every weekend. At the end of the day, the biggest change to my iPad workflow is iOS 8 and the added processing power of the iPad Air 2. The power of extensions and widgets combined with extra RAM and extra processor zip have made my iPad more useful than ever. My MacBook has never felt so lonely. Next, my iPhone for November 1, 2014. Even less has changed on the iPhone front for the first day of November. Gone are Editorial, MLB at Bat, and VSCOcam, and in are Byword, Drafts, and Circa News. I’m sure I’ll end up flipping Editorial back onto my homescreen once it has been updated for the iPhone 6 Plus screen, but I would be surprised to see VSCO Cam make a return in the future. First, Byword has replaced Editorial as my text editor/document manager on the iPhone. 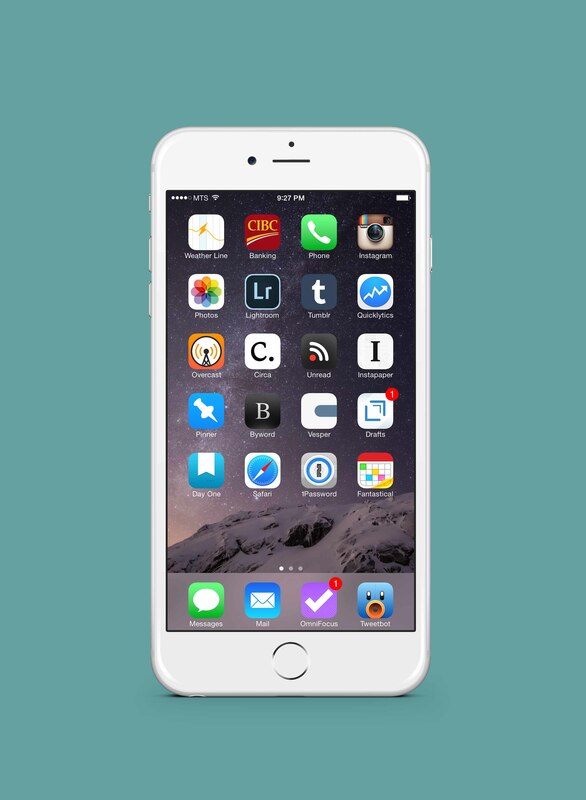 Byword has been updated for the 6 Plus and that’s the only reason it is here. Second, MLB at Bat has officially swung past its use and I’m sure it’ll come back sometime around April. Third, and most importantly, VSCO Cam’s iPhone 6 Plus apprehension has driven me up the wall. We see updates for the app, but nothing optimizes it for the bigger screen. Meanwhile, Adobe Lightroom for iPhone far surpasses VSCO Cam in term’s of editing performance and nothing beats syncing my edits straight to my MacBook at home. I would be very surprised to see VSCO Cam make a return. Like the iPad, I’ve added Drafts 4 to the mix and it acts as a nice companion to Vesper. Vesper houses my lists and long term notes, Byword holds my documents, and Drafts holds all my short term text. Drafts 4 is an excellent update and is completely worth the extra few bucks. Lastly, Circa News is awesome. Curated RSS feeds and Twitter timelines can miss some of the most important news of the day. When that happens, Circa has their backs. I love the ability to follow specific news stories and get updates to those stories at points in the future. I would like to have more business news float through Circa’s list, but I can find that elsewhere if I’m looking for it. That’s that for another month. The difficulty in deciding which iPhone to buy has only transferred over to deciding which iPad to keep. I think I know which way I’m leaning, but the more I use the device, the less clear things become. Apple is getting good at sticking its fingers in my pocketbook each and every year.